Welcome to my first Super-Blog Team Up of 2019! 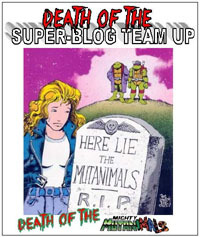 The SBTU is a group of content creators (bloggers/podcasters) who periodically come together to–as a whole–touch on a certain shared topic or theme…teaming up to look at a number of different ways that the topic or theme has been done in comics and such…as we all have our own blogs and angles at covering comics and pop culture. For this outing, the theme is Redemption, or Coming Home. As with my last entry in the SBTU, I’ve elected to go back to the Teenage Mutant Ninja Turtles. Previously, I took an in-depth look at the Mighty Mutanimals…specifically, the Death of the Mighty Mutanimals in the pages of the then-Archie-published Teenage Mutant Ninja Turtles Adventures (TMNTA) title in the early/mid 1990s. This time out, I’m looking at probably the best-known TMNT villain–The Shredder. To start out and focus a bit, let’s look at a couple of quick definitions as found online. Redemption: the act, process, or an instance of redeeming. Redeeming: serving to offset or compensate for a defect. There we go–that’s more along the lines of my thought with the word, if I had to put it out there concretely. Redemption is taking something not-so-good, and making it better. Whether taking something I didn’t like and making it something I liked; taking some unlikeable character and making them likeable; turning a disinterest into an interest…there are a number of ways to take it. 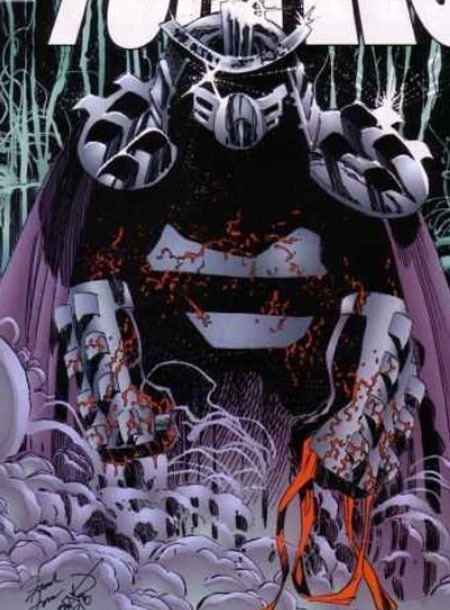 In terms of the Shredder, my memory proved a bit faulty as I set out expecting to look at the Shredder going from an out and out villain to being–if not exactly an anti-hero, then at least more like a Magneto circa the original Age of Apocalypse. 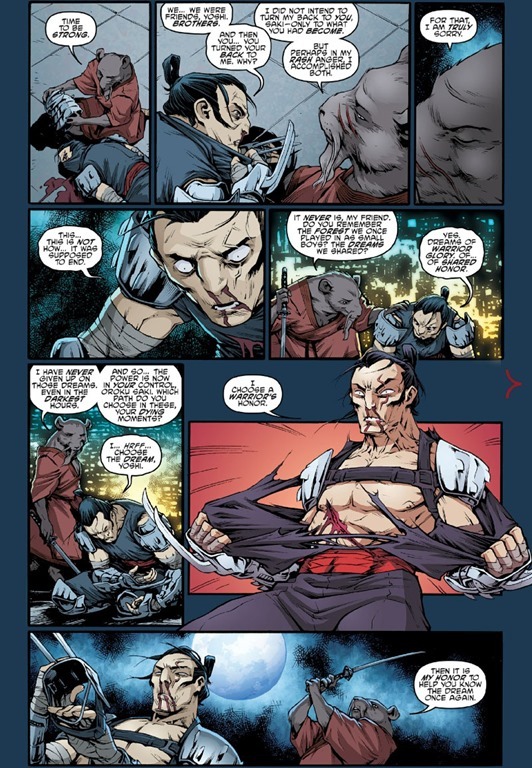 In this re-examination, though, I’ve realized that the Shredder still more than fits this idea of redemption…as the character started out JUST as "some villain" to me, grew to be an element I disliked (as the character felt over-used and over-exposed for being essentially a one-off or two-off villain in the original Mirage comics), and ultimately has become a character I’m interested in and find to be more complex and deep than just "Ha-ha-ha-ha! Tonight I dine on turtle soup!" I’m not just observing the "fact of" there being different versions of the Shredder. The different versions have informed my interpretation of the character, the way I’ve seen or appreciated the character…and I’ve "been there for" many of their introductions and development across the years. I recall not thinking much of this "as a kid." At the time, it just WAS. That was what the show was. Shredder’s the bad guy, and the turtles stop him. Sometimes he works with Krang, sometimes he and Krang are at odds, often their being at odds affords the turtles their means of victory. Especially in retrospect, it seemed overly simple, and fairly off-putting that across however many seasons, Shredder just went from plan to plan to plan and was defeated each and every time by the turtles, but always got away. He’s incapable of defeating the turtles and virtually defines insanity with trying variations of stuff again and again and again. 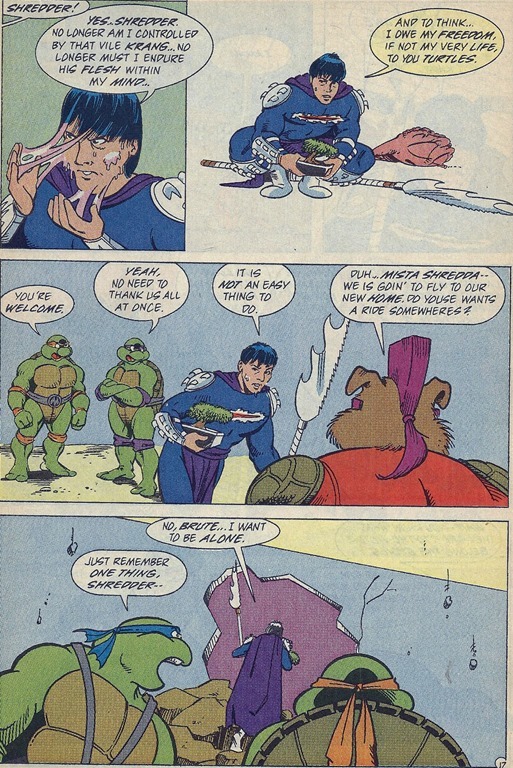 While there were occasional "moments"–and I think specifically of "Shredder’s Mother" from an episode or two, or Shredder "creating" the "Punk Frogs" in an attempt to duplicate what he saw Splinter having with the Turtles–that allowed a glimpse of the potential for something deeper, more in-depth to explore with characterization…it just didn’t happen in this series. That alone could be a topic for a huge post or series of posts, and I’ll leave off at that. I was already familiar with Shredder–obviously–from the cartoon series. So it just made perfect sense that he would be the villain of the movie. The film was live-action, with costumes for the turtles and various animatronic/effects to bring them to life. The film was a lot darker and seemingly more violent than the cartoon…if only for the fact of seeing "live" turtles interacting with actual humans, the violence being "actual" violence rather than just animated "cartoon violence" and all that. This Shredder, like the cartoon version, was basically a villain for the sake of being a villain. He had a history in the sense of having a past with Hamato Yoshi. But other than "just" being some jealous guy who couldn’t get the girl and so killed her and the guy she chose…he was just some figure to blindly seek the destruction of the turtles. There wasn’t much depth explored in his running the Foot and masterminding their New York crime spree. There was plenty of depth SUGGESTED, but for a relatively short "kids’ film," it wasn’t explored in any great degree in terms of him as an individual…nor was there room for such exploration in the time allotted. When the character "returned" for the second film in 1991, it was with even less depth…no longer was he interested in this Foot Clan…he just wanted the turtles destroyed. We got Tokka and Rahzar out of this (presumably due to issues with bringing Bebop and Rocksteady to live action) with Shredder determining that he needed his own mutants to take on the turtles. 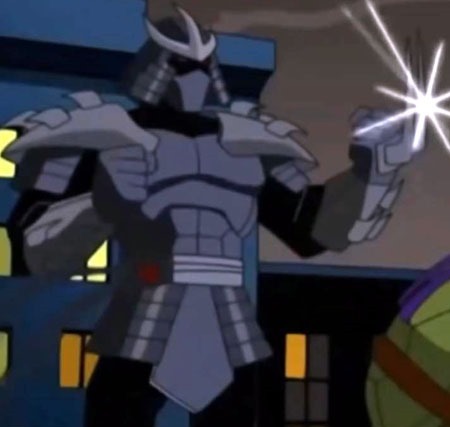 Many people probably remember the "Super Shredder" from the end of the film (and this was brought back conceptually late in the 2012 series with its Tales of the TMNT season). While cool in concept, a mutagen-enhanced Super Shredder could have posed a huge threat, but wound up not even fighting the turtles–it just blindly destroyed support beams and brought a dock down on itself. I imagine this was partly a matter of budget and the extent of effects as well as time–who’d want a 2 1/2 hour film aimed at kids, after all? (ha, ha). Again…as a kid, I didn’t think much of this, and it is much more in thinking back to it that I’ve noted various deficiencies to the character, how he was presented, and all that. I still to this day in 2019 consider TMNT (1990) one of my favorite films and will watch it time and again, year after year, sometimes more than once in any given year. But that doesn’t change just how shallow Shredder feels (to me) as depicted in this live action film universe. Somewhere around this time–1989-1991–I got ahold of several graphic novels from "the library" (utilizing the local library, but I believe via their inter-library loan system). These were colorized versions of the original TMNT comics published by First. Initially I only knew that these were a version of the turtles; but quickly realized these were essentially the actual, original comics–just colored–that introduced the characters I’d come to know from the cartoon series. They were a lot more violent–and the turtles in particular actually killed. The Foot (like in the movie, though it was the movie that was based on these comics) were human and thus could be killed (they were not the generic "robots" that the cartoon had). In looking back, I believe the first of these I read was actually the fourth, where Leonardo was first badly beaten by the Foot and then the rest of the turtles and April dealt with the Shredder being "back." This definitely stood out as the story was where large parts of the film got their inspiration…though in the film it was Raphael that was badly beaten by the Foot rather than Leonardo. In these graphic novels, we had a Shredder who was definitely human, and in some images rather scrawny; hardly the well-muscled buffoon of the cartoon or the fancily-garbed film character. He was dangerous, meant to kill Splinter and the turtles, had killed Yoshi and Tang Shen, had Leo badly beaten, destroyed April’s home, and drove the turtles from New York. 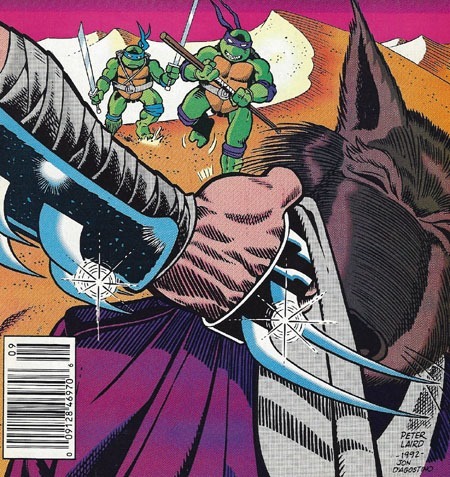 (It was some time later that I eventually learned of and got to read the Return to New York story where we found out exactly HOW Shredder had returned, and was finally finished off for good by Leonardo). One of the most memorable parts of that graphic novel was a multi-page foldout showing Shredder and a bunch of Foot waiting in ambush! And this comics version of Shredder–while not overly-well-developed–was definitely quite dangerous, perhaps moreso for not being in every single issue/chapter. Meanwhile, there was the Archie-published Teenage Mutant Ninja Turtles Adventures comics. The first few issues–a 3-issue mini-series and the first 4 issues of the ongoing–directly adapted the first season and the first couple or so episodes of the second season of the cartoon. As the comic series diverged greatly from the cartoon into its own continuity, we saw a shift away from Shredder as the core/primary antagonist. He was still a major antagonist but not the primary/sole antagonist. After being defeated and jailed in TMNTA #13 he was out of the picture until TMNTA #21 and then hung around for a few issues’ stories before being "saved" by the Turtles in TMNTA #25. That story had seen Shredder violated by Krang–who had himself attached to Shredder to control his body; and certainly destroyed any likelihood of the pair "working together" again (to say nothing of Krang being left–"re-banished"–to a toxic waste dump-world basically being the last I recall offhand of Krang in that series, period). Having been saved by the turtles, Shredder was now in their debt–he owed them. The next time Shredder appeared was almost a year later in TMNTA #36 working with a new villain–Verminator-X. Here he and the new villain captured Splinter and were about to make off through a time-portal when Leonardo reminded Shredder that they’d saved his life and he owed them. Honoring this debt, he released Splinter back to them, declaring the score even and that the next time they crossed paths there’d be "no compromise." I don’t recall offhand if or where we ever saw this Shredder again after that, as the series had more than moved past his being a required antagonist. Perhaps that is why I’d thought I remembered a more proactive "honor" to Shredder’s behavior prior to rereading TMNTA #36. 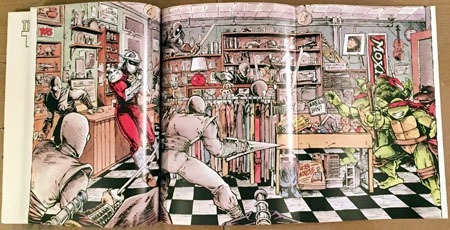 When the original Mirage TMNT series "finally" made it to 50 issues–some 8 years after #1–original creators Eastman and Laird launched their largest singular story arc in City at War, running from that 50th issue to #62. 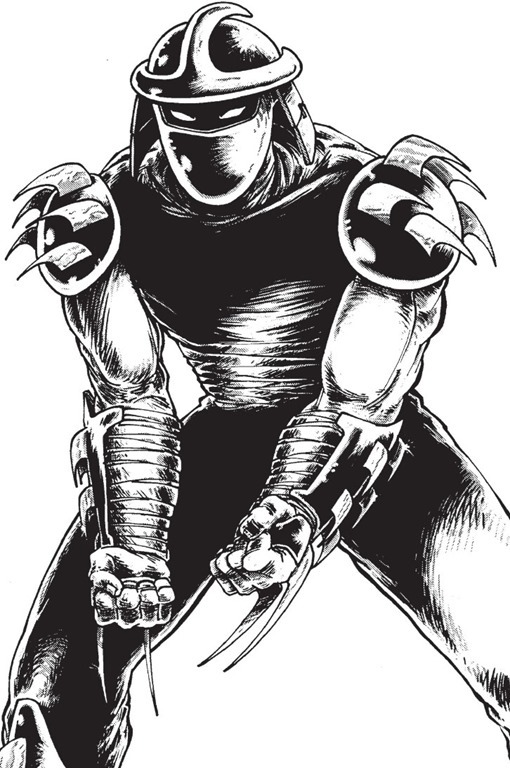 Among other things, this story introduced us to Karai, a new element in the legacy of Shredder and the Foot. 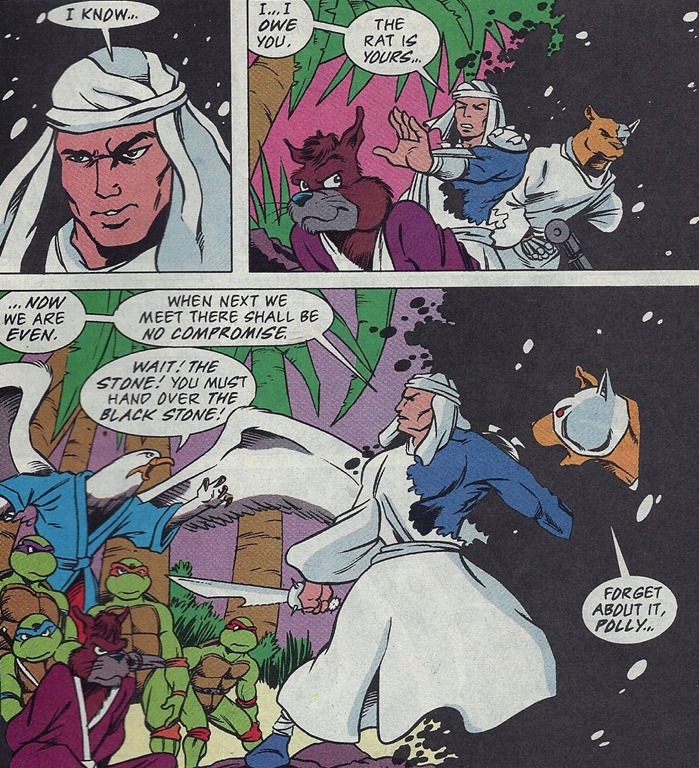 In that story she at one point disguises herself as the Shredder, and eventually more or less declares the Foot to be at peace with the turtles–each group will leave one another alone. That Shredder’s influence was still felt and had Foot acting based on what he’d set in motion showed how deeply Shredder was a part of them…and how significant it’d then be for the Foot to not be seeking the turtles’ destruction. 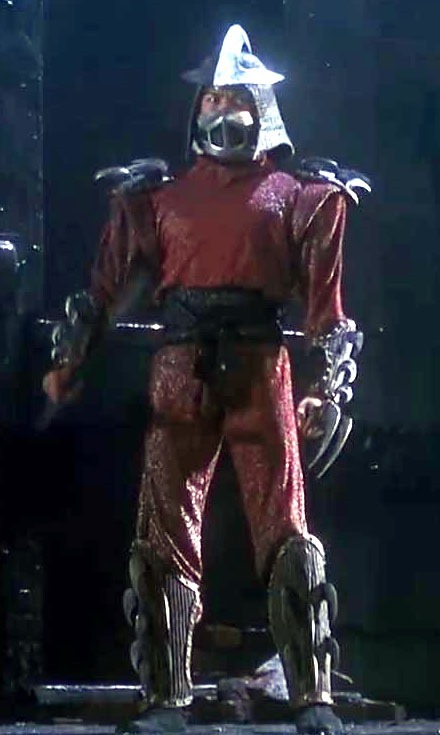 I believe Shredder may also have been slightly used in the live-action Next Mutation series…but that continues to remain a near-complete blind spot for me in TMNT history. With a new animated series that premiered in early 2003, the TMNT were back–though this series was much more a serialized story than the one-off episodic nature of the original. This allowed it to follow comics elements a bit more, as well as to have deeper, ongoing development of characters. I recall it beings several episodes in before we met the Shredder at all, and still a few more before the turtles realized he was a threat, and several more until he really became a definitive villain figure for the series. After a lot of development, much of which was tied to the original comics…it was eventually revealed that this Shredder wasn’t even human at all! 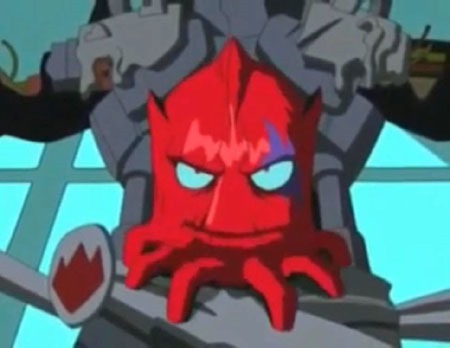 He was actually an Utrom, one of the aliens introduced over the course of the series. To me at the time, this was an excellent twist! Krang had been based on the Utroms, and in the ’80s cartoon was closely tied to Shredder. And in the Archie comics, Krang had once attached himself to Shredder, AS Shredder. And so here, we had an Utrom who actually was the Shredder. It also allowed for a longevity across time that would not have made sense for a single human, but played well into stuff set up throughout the 2003 series. Ch’rell as Shredder was also involved in the 2009 animated film TMNT Forever and proved to be the most dangerous of the various Shredders to that point. This animated film essentially capped off the entirety of the TMNT to its point, ending 25 years’ development. With the TMNT property sold to Viacom/Nickelodeon, it had a fresh start after 2009. Firstly in the 2011 debut of a new ongoing comics series from IDW, secondly in a new animated series that premiered in 2012, and then in a new iteration of live-action films in 2014 and 2016. With the 2012 TMNT animated series we had yet another Shredder. This one seemed relatively similar to previous versions, with elements of the backstory much the same–animosity with Hamato Yoshi, involvement in the turtles coming to be, and so on. But there was something deeper here, as this Shredder not only caused the death of Hamato Yoshi’s wife, but also apparently that of their daughter! However, it was then revealed that he had a daughter of his own–Karai. Yet this turned out to be only part of the story…as Karai was revealed to actually be Yoshi’s daughter–she had not been killed, but was kidnapped by Shredder and raised AS his own daughter. While in some ways rather cliche and such, it certainly gives a bit more depth and potential to be explored–having "Shredder’s daughter" actually be the daughter of Splinter, and being thus torn between the two; deeply influenced by both. 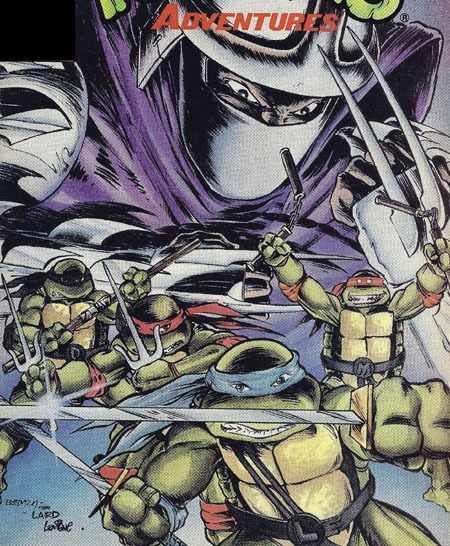 I still have a number of blind spots even to this animated series, but recall Shredder’s absolute hatred of Yoshi–Splinter–driving him to attack and kill Splinter, even at the cost of the very Earth itself when the alien Triceratons invaded and everyone had to work together to save the Earth. I believe time travel undid that, but that he then still wound up killing Splinter later after being mutated into a Super Shredder (with a look and name based on the 1991 film version of the character). 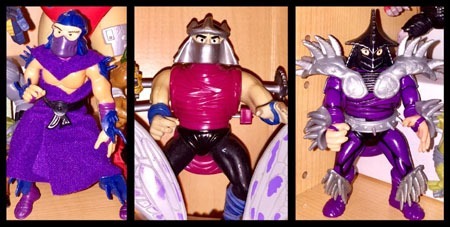 While there’s some development and difference from previous versions–which is good–there’s something to this version of Shredder that just seems a bit uninteresting to me, being so driven by his hatred of Splinter and the turtles, as well as the 2012 series’ overt (and to me, over-) reverence of the 1980s cartoon while seemingly ignoring the 2003 series. 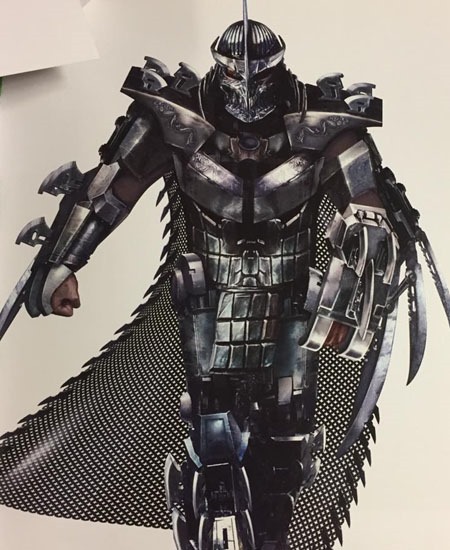 The newer film Shredder from the 2014 and 2016 films seems extremely flat and uninteresting to me. The only details that really stood out and that I remember are the way the armor was so over the top and ridiculous, and came off a lot like the "Silver Samurai" character from 2013’s The Wolverine film. I vaguely recall the character essentially only having a cameo in the 2016 film. That I really don’t recall more detail about the character from either film–despite their recency, that I actually saw them, and being the TMNT fan that I am–feels rather telling about the sheer shallowness of that incarnation of the character. Where it feels like Shredder has really been done the best is the IDW comics…the current ongoing continuity of the TMNT. And really, in many characters’ cases, I feel like the IDW "version" has become THE definitive version. Both for being the "current" or "live" version at present as of this writing…but also because of incorporating different elements to make an amalgamized version that takes good ideas and brings them together into a single version. Typically my favorite example is Bebop and Rocksteady, who I had thoroughly disliked from the late 1990s until their introduction in the IDW TMNT series. They’re still the big, dumb buffoons…but they’re genuinely dangerous, and we’ve seen them cause true destruction…as well as nearly kill Donatello. Over-simplifying, perhaps, but to quickly sum up the IDW series: Splinter and the turtles are mutated animals, but they’re also the reincarnated spirits of Hamato Yoshi and his four sons who lived several hundred years ago in Japan. 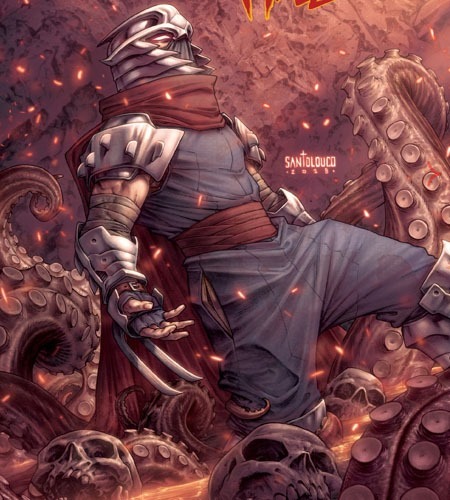 Shredder is the same Oroku Saki that lived then as well, resurrected via mystical means involving a member of a group of god-like entities known as The Pantheon. So there’s this multi-lifetime/multiple worlds sorta struggle going on, where an animosity from hundreds of years ago is replayed in the present. 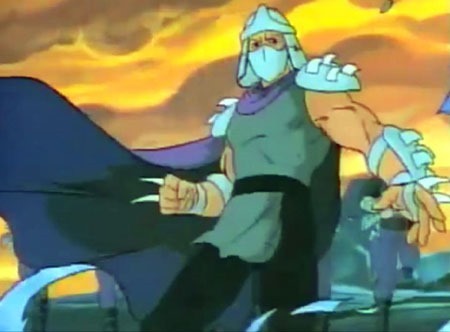 Shredder was not introduced immediately in this series, and his introduction involved some buildup, as well as skepticism from some of the characters. 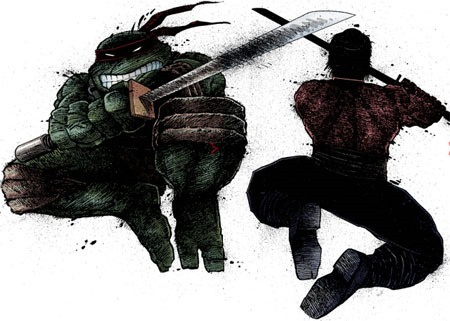 He and Splinter recognized each other pretty quickly as both realized how deep their ties went–Shredder and Splinter, Oroku Saki and Hamto Yoshi. Over the course of 40 additional issues, we learned a lot more about Shredder and the Foot Clan, and there was more involving reincarnation and the interference of the Pantheon member Kitsune. This Shredder was dangerous and deadly, tried to corrupt and kill the Hamato family (as he had done in the past), was working with alien warlord Krang for a time, and generally was a major villain that made sense, had depth and mystery and development with room for a lot more development over time. And then 40 issues ago (#90 is a January 2019 issue), in TMNT #50, things came to a head as he and Splinter fought…and ultimately he was defeated. Not just defeated, but killed–committing seppuku. We’d learned over the series that he and Splinter–Hamato Yoshi–had been clan brothers, and raised from childhood together. Essentially actual brothers as well as sharing a clan. This alone added so much depth…especially to me, being familiar with and able to draw extra context/"feeling" from the likes of Magic the Gathering: The Brothers’ War, about a different pair of brothers and how their rivalry wrecked a world. Now, just this month (again, January 2019) we have the beginning of a new "tie-in mini-series" TMNT: Shredder in Hell, that picks up with Shredder dealing with the spirit of the founder of the Foot and his own ties to said spirit; that everything he has done and been has been influenced; and even now, dead, he has a further journey to discover who he truly is. I’ve not been the biggest fan of the TMNT series since #50. Much as I’ll rail against Shredder being the end-all/be-all of TMNT villains, the way he was worked into the fabric of the IDW TMNT series, his death felt like this huge breaking point or split. Like #51 was a whole new #1 of a whole new Shredder-less series (and it absolutely WOULD have been a new #1 if TMNT was a Marvel property!). 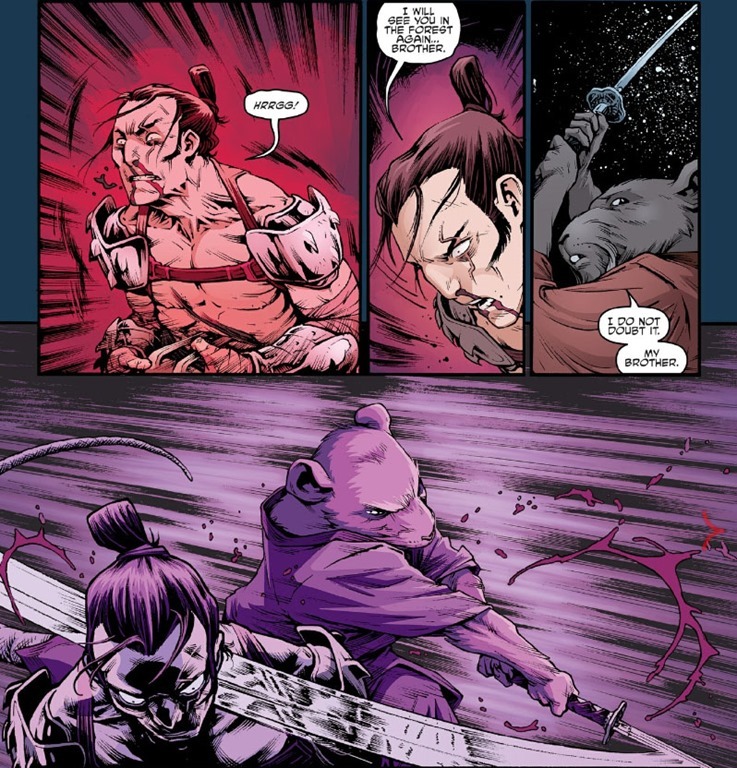 Though with Shredder’s death, Splinter wound up being leader of the Foot–a point that has forced further development of the turtles themselves as well as the relationship between them and their father…and that’s been interesting in itself, and helped to make Splinter more interesting, as more than just some wise old rat or father-figure who is always "right" and just kinda "there" for the turtles. 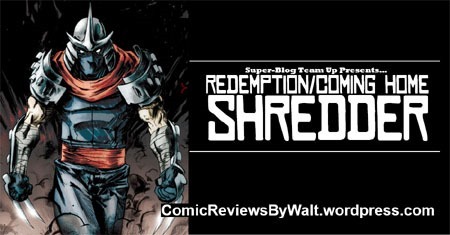 We had a long introduction and building-up of IDW‘s Shredder across 50 issues. While not the SOLE antagonist, he was a major, ongoing antagonist with stuff going on in the background even if not serving as a focal point of a given story. In another life, he killed Hamato Yoshi’s sons in front of him, before killing Yoshi himself. In this life, he had a drastic effect on Leonardo, temporarily corrupting him and showing the turtle a whole different perspective on things, giving us a "dark" Leonardo…a chapter of life that has affected the turtle and still holds relevance (the City Fall story arc). I’ve felt the absence of Shredder in the title and wondered where all it can and will go without the character…as well as where Splinter will be taken, story-wise, with the Foot; as we have never before had a TMNT series last this long with so much development in quite this way. Yet now with Shredder in Hell, we’re getting a new story of Oroku Saki, following events already built up, as they’re expanded a bit. And I have no idea where it’s going, but as we already have reincarnation and resurrection, it would be quite believable to see Shredder resurrected–albeit temporarily–despite seppuku. And as a 5-issue/5-month series, this will end about the time of TMNT #94…a mere 6 issues until the big 100th issue and whatever that holds. I’m interested in this Shredder. I’m curious about where things go. I find the character engaging, and look forward to what’s going to happen. 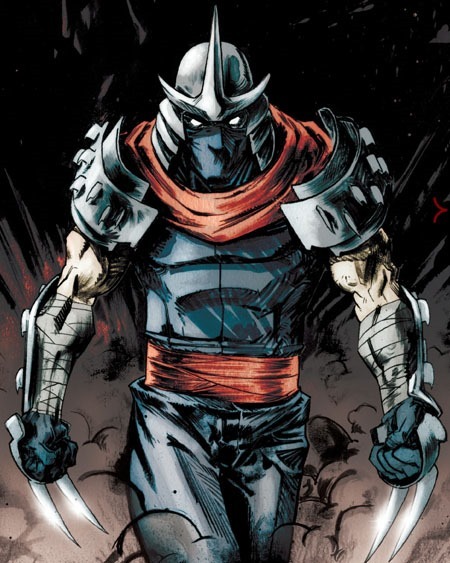 It seems plausible that even if he doesn’t physical return, there’s more yet to be "revealed" about the character that will impact the TMNT, and I believe this is the first time in nearly 35 years that there’s actually been a Shredder-focused series such as this, and I’m wishing it was weekly. For what started out as a rather generic villain with little real development to a complex, deep character with much potential yet unexplored…IDW has certainly redeemed the character for me. Having followed the entirety of the IDW TMNT continuity since August 2011 when it started, having missed Shredder’s machinations and involvement, getting this new story with a lot of potential and all that…it is in its own way like "coming home." After a lot of time showing that there’s more than just Shredder to serve as antagonist, we’re back to Shredder having SOMETHING going on, and I’m enjoying that it’s not just some one-off thing or quickly-resolved "moment" but seems poised to be more significant. Even if he doesn’t directly interact with the actual turtles in continuity, just the fact of getting a new story about him, now, and it having any tie at all to current continuity is a good thing, and has me all the more excited about the coming year of TMNT. This also has room to give Shredder a very solid, valid grounding as a favorite villain for me–as opposed to merely "sentimental value" or bias just for being one of the first villains I ever "met" as a kid first discovering fictional worlds and all that. Much as with my last SBTU post, this is easily one of my longest, wordiest posts…significantly beyond what I usually write. But it’s not every day that I get to participate in something like this…and with all the great work of fellow SBTU folks, I’m given the incentive to push myself to go beyond the casual usual. I was one of those people who actually discovered TMNT a couple of years *before* the cartoon series, when Mirage was first publishing the original black & white comics. I got in a bit too late to get the first several, which skyrocketed in value, but I was able to pick up a few in the mid-1980s. So I knew of Shredder right from the start, but I realized that he was just one of several adversaries who fought the Turtles. There was also Savanti Romero and the Triceratons and some generic gangsters and a few other bad guys who the Turtles encountered. So when the cartoon came out I was a bit disappointed that Shredder was THE number one bad guy who appeared in every single episode, and that he was a lot more comical & incompetent than the comic book version. I appreciated this run-down of the various versions of the character. I have very fond memories of the original Mirage series. I’ve never read the IDW series, so it’s interesting to learn what they did with Shredder in those stories. That was a fun read. It was an interesting exploration of all the different versions of the character.